Amber O’neal & Angel Orsini have made an impression on the wrestling industry for many years as singles competitors even wrestling each other. In the last couple of months Amber & Angel teamed up to do the popular internet radio show “3 way with Fire & Ice” that airs live every thursday night on pw247radio.com and now have decided to take the act in the squared circle. Debuting the gimmick at Big Time Wrestling in Newark,CA Jan 20th…(more info to come on this match) and again at the Wrestlereunion Arenachicks Mini show for the VIP guest at Wrestlereunion 6 friday Jan 27th in Los Angeles, CA . Fire & Ice will be wrestling against Becky Bayless(formerly known as TNA Knockout Cookie) and Shelly Martinez(formerly known as WWE Diva Ariel & TNA Knockout Salinas) who will also be debuting their new tag team as well!!!.. These girls along with more Arenachicks TBA will also be available for autograph signings and photo-ops during the convention hours of Wrestlereunion! To learn more about these Arenachicks visit their official websites! it kills me that i won’t be in Cali to watch you ladies in what i know will be a classic in the making! i wish all of ya’s the best of luck and hope you all have fun! i will continue to do my best to help out in anyway i can. i have a Twitlonger Promo in the Works for ya’s for your appearance at Wrestlereunion 6. once i get all the info on who else will be there i will be posting my Promo daily on Twitter! Sending all 4 of you lots of love and positive vibes your way! 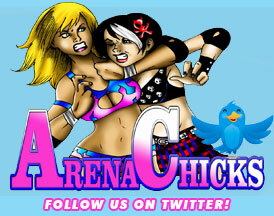 LONG LIVE ARENA CHICKS, PW247radio.com BlogTalkRadio.com/funtimeradio and to the Womens Wrestling Movement!!! God Bless!